Place the popcorn in a large bowl, and pour the melted chocolate over it. Then use a spoon to toss the popcorn gently until it is evenly coated with the chocolate. Spread the popcorn out evenly on a baking sheet covered with parchment, wax paper, or aluminum foil. 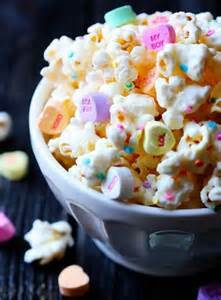 Sprinkle evenly with the salt, then sprinkle with as many sprinkles and conversation hearts as you would like. Let cool for 10 minutes or until the chocolate has hardened. Break up into small pieces then serve or store in an airtight container for up to one week.